Playacar Palace is an all-inclusive resort located on a beautiful stretch of the Caribbean Sea in Playa del Carmen. Featuring an expansive spa, Playacar Palace boasts a relaxing, refreshing atmosphere for guests seeking a vacation in tranquility. Enjoy delicious meals, sip a refreshing drink at the swim-up bar, unwind in the in-room Jacuzzis let yourself indulge in paradise. The all-inclusive Playacar Palace is located on a beautiful stretch of the Caribbean Sea and is within walking distance to Playa del Carmen's famous 5th Avenue. Enjoy sumptuous meals or sip a refreshing drink at the swim-up bar or join in the fun at the lively lobby bar. All beautifully appointed rooms have double Jacuzzis and new 'Palace beds', and most rooms have a view of the sea. Guests enjoy access to the renowned Playacar Spa & Golf Club, and golf packages are available. Please note that due to environmental factors and natural erosion beach size is susceptible to constant change and may vary seasonally. Special Features include complimentary long distance calls from your room within Mexico and to the US and Canada, complimentary honeymoon amenities and exclusive adults only concierge level. Playacar Palace is pleased to announce its unveiling of an extensive, multi-phase remodel. The transformation elevates the resort to the highest possible luxury standards, with upgrades to guest rooms, lobby, front desk, restaurants, and lounge areas. The new interiors blend many contemporary, yet classic, elements. Each of the 201-rooms boasts new décor, installation of modern furnishings, enhanced showers and vanity areas, top-of-the-line Lavazza coffee makers and advanced jets added to the in-room double whirlpool tubs. Technology updates include readily available suite access, via state of the art wristbands allowing guests to open the door to their suites with a wave of the hand. Technological upgrades were also made to the property’s AC systems, featuring new hydraulic systems to ensure the resort meets eco-friendly standards. The property’s swanky main restaurant, Café del Mar, now features a cold show cooking area which allows guests to see the artistic plating-style of each dish as it receives its final touches. In addition, the Italian cuisine restaurant has reopened as Bocelli, sporting a new style and menu. Momo, known for its traditional oriental cuisine, features a new menu built to create a culinary sharing experience for the whole dining party. Adding to the culinary experience, the brand has also formed a partnership with talented pastry chef, Antonio Bachour. All Palace Resorts now feature an exclusive menu selection of decadent desserts and pastries, exclusively curated by Bachour. A new, intimate culinary experience has come to Playacar Palace! The brand new Alquimia is a restaurant designed to immerse guests in a full-on dining experience that combines the best of Playacar's food, music and art. Guests will receive a taste of culture, with Latin American inspired dished, sure to delight even the most selecive guest. Max seating: 12 people. Additional charges may apply. This beautiful deluxe resort is in a matchless location - the center of Playa del Carmen. This is the true heart of the Mayan Riviera. Playa del Carmen is the cultural, artistic, shopping, dining and nightlife hub for the entire region. You are just steps from the world renowned Fifth Avenue, widely known for its bohemian flavor and its eclectic collection of sidewalk cafes, open-air restaurants, boutiques, galleries and clubs. The ferry terminal is only a block away, with frequent high-speed ferry service to Cozumel. The world-class Playacar Spa & Golf Club is a five minute walk away. Not to mention this being a superior base to explore all the wonders of the Mayan Riviera from Xcaret to Tulum. If you are looking for an alternative to Cancun without being too removed from civilization - look no further! 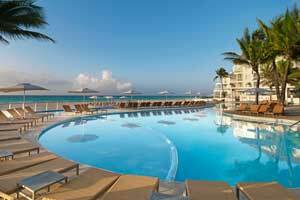 As a Palace Resorts guest, you may take advantage of the facilities and services including restaurants, bars, activities and entertainment at the other Palace Resorts in Cancun, Cozumel and Isla Mujeres. (Transportation to other resorts is not included.) Please note: Guests of Sun Palace must be at least 18 years of age. The Palace Resorts App is available now as a free download in both English and Spanish on the iTunes App Store and Google Play Store. Palace Resorts is the FIRST and ONLY hotel chain to offer Certified Angus Beef ® to guests in all 8 of its luxury all-inclusive resorts. The partnership and investment of only offering Certified Angus Beef ® is a testament to Palace Resorts’ commitment to only offering premium culinary products to guests. The Certified Angus Beef® brand is the original brand of premium beef, created in 1978 by a group of family ranchers. Each cut meets or exceeds 10 standards for quality more selective than USDA Choice and Prime, ensuring its flavor, tenderness and juiciness. It is proudly featured by 16,000 restaurants and retailers around the world. Kids and Teens Stay Free at Palace Resorts! 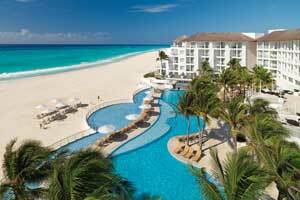 Have the coolest family vacation ever in Mexico and Jamaica! Not only do kids will stay, play and eat for free, but families also receive up to $1,500 Resort Credits to experience the destination with tours, dolphin swims, and so much more! Book your vacation at a Palace Resort for 12 plus nights and earn up to $2,500. This is cash back for guests to use toward rounds of golf, spa experiences and more. There is no need to book in advance, just visit the Palace Vacation Planner desk upon arrival to reserve an activity or get some ideas. TERMS AND CONDITIONS: Amounts shown are the maximum Resort Credit that can be applied toward each product/service, accumulating to US $2,500 per room/stay (12+ nights); US $2,000 (9-11 night stay); US $1,500 (5-8 night stay); US $750 (4 night stay); US $500 (3 night stay). Accommodation categories with more than one room will receive the amount of Resort Credit per room per reservation. Reservations for services and amenities must be requested at the resort upon arrival and are subject to availability. Resort Credit is cash on your hotel account and cannot be reimbursed in cash. All used Resort Credit amount is subject to a 16% operational fee. Promotion does not apply to Famtrips, travel agent or employee rates, complimentary, incentive or compensatory stays. Not combinable with any other unused credit. Unused credit cannot be reimbursed in cash, is valid for up to 1 year from the check out date, is transferable once to one guest, and does not apply towards spa treatments. International Calling: Only calls made to Mexico (fixed lines), USA (excluding Alaska, Hawaii and Caribbean) and Canada are included. 16% tax will apply for the remaining regions and must be paid at checkout. Golf: Valid toward rounds of golf at regular price, lessons at the Moon Palace Golf Academy in Mexico, but not toward club/shoe rental, purchase of other products. Includes transportation to Riviera Cancun Golf Club. Transportation, food and beverages are included at Moon Palace Golf Club and Riviera Cancun Golf Club. At Grand Coral Golf Club transportation is included, only food and beverages are not included. * Scuba Diving: Resort Credit at Cozumel Palace can be used towards diving (2 tanks) for certified divers or for beginners and noncertified divers guests can opt for Discover Scuba Diving. The maximum amount for this activity depends on the length of stay. For Isla Mujeres Palace the maximum amount for diving (1-tank) or Discover Scuba Diving is US $300 for a stay of 5–8 nights and US $150 for stays of 3 or 4 nights. The remaining balance of the Come Back Soon Card will not be valid towards Scuba Diving at Isla Mujeres Palace. ** Vacation Memories: Value on Vacation Memories is US $250 regardless of the amount of nights. Applicable service fees can be paid with cash, credit card or other authorized means. *** Special Dinner (Romantic, Chef’s, Wine Tasting, Alkimia): Romantic dinners are for adults and for couples only. Does not apply to parties of more than 2 people. Resort Credit may not be used to purchase romantic dinners at other resorts. The special dinners vary according to the resort where you are staying, reservations are required, based on availability and location may be changed due to inclement weather conditions. Moon Palace boat transportation is subject to weather conditions. +Additional fees apply. Dock fee and National Park fee are not included. Bowling at The Grand: Bowling shoes rental with socks are included with the rate. The information on this flyer is subject to change. Additional restrictions or exclusions may apply at the time of bookings. Certain restrictions may apply. Palace Resorts has introduced a new spa at Playa del Carmen’s Playacar Palace as part of the resort’s enhancement project. The 11,000-square-foot spa features six treatment rooms and a wide range of custom-designed spa treatments. It also offers a manicure-pedicure station, his and her spa areas and lounges, sauna, color aromatherapy steam room, ice plunge pool, thermal whirlpool and four heated ceramic lounges. Guests who book a stay of five nights or more can also take advantage of the $1,500 resort credit to use toward the brand new spa and beauty salon.